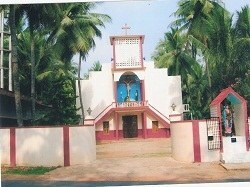 St. Joseph's Church, Irussumanda was established in the year 1984 in the diocese of Eluru bifurcating the parish of Pallivela which is 15kms away from the Centre. From the time of the erection of this parish till 2002 it was administered by the diocesan clergy of Eluru. It was in the year 2002 that the then bishop of Eluru Diocese, late Rt. Rev. Bishop John Mulagada invited the Vincentians to take care of this parish. Having seen and been satisfied with the works of Vincentians, the diocese entrusted the parish to Vincentians for ad use perputum in the tear 2006.Ever since the parish was entrusted to us we have been striving to improve the quality of Christian life and the participation of the faithful for the smooth running of the parish. Our confreres paid great interest and effort in the fields of pastoral, social and educational development. At present there are two confreres working in this parish. To help in the parish ministry there is a catechist. Besides the catechist, there is an animator from the diocesan Jyothirmayi society for conducting BCC programmes in the villages. FCC sisters of Kanjirappilly province of Eluru region are serving in the parish. They are running an English Medium school and a snakebite healing centre. They have also taken up adult education, health care and women empowerment programmes. St. Vincent de Paul Society is also excellently working for helping the poor and needy of the parish. Recently a beautiful shrine was constructed and dedicated in the parish to Holy Family and the Sacred Heart. The parish has 2 substations and 13 family units under its jurisdiction. The parish is dedicated to St. Joseph and the parish feast is celebrated on 1st May every year.